Federal Middle District Judge Sylvia H. Rambo recently issued two (2) Opinions on the issue of punitive damages in a trucking accident litigation entitled to Stemrich v. Oleh Zadiyaka, No. 1:12-CV-01409 (M.D. Pa. 2-21-14 Rambo, J.). This matter arises out of a trucking accident that occurred on September 28, 2011 on Interstate 83 North when the Defendant truck driver allegedly rear-ended the Plaintiff’s vehicle on the highway. This allegedly caused a chain reaction accident with two (2) vehicles ahead and allegedly resulted in injuries to the Plaintiff. In one of the Opinions, Judge Rambo denied the Defendant’s Motion for Partial Summary Judgment on the issue of punitive damages. With regard to the Motion for Partial Summary Judgment on the punitive damages issue, the Defendant asserted that its Motion should be granted as there was no evidence of that suggested that the Defendant acted recklessly. After reviewing Pennsylvania law with respect to reckless conduct and punitive damages, the court found issues of fact, including expert report from the Plaintiff, all of which served to defeat the motion. The court additionally noted that the dispositive issued presented required an assessment of the Defendant’s state of mind at the time of the accident under which circumstances the law held that a court should be reluctant to grant a Motion for Summary Judgment as a determination of that issue largely depends upon the credibility of the witnesses testifying as to their own states of mind. As the court found that the determination of whether the Defendant truck driver subjectively appreciated the risk of harm involved or whether he consciously disregarded that risk all required an assessment of the Defendant truck driver’s credibility, the court left that issue for the jury to decide. The court also allowed the claim for vicarious liability of a trucking company for punitive damages to stand and proceed to a jury. Any one wishing to review the Court's decision denying the Motion for Partial Summary Judgment may click this LINK. In a separate Opinion in the same matter, Judge Rambo granted the Plaintiff’s proposed method of bifurcation in conjunction with a punitive damages claim. More specifically, the Plaintiff argued that the trial court should be bifurcated into two segments: first, the jury should consider whether the Defendant is reliable for the injuries alleged, whether the Defendants’ conduct was recklessly indifferent, and the amount of compensatory damages to be awarded; and second, the jury should then be permitted to consider the amount of punitive damages to award, if any. In so ruling, the court rejected the Defendant’s request that the trial be trifurcated into three segments: first, a jury consideration of whether the Defendants were liable; second, a jury consideration as to the extent of the Plaintiff’s alleged injuries and the amount of compensatory damages; and third, a jury consideration of whether punitive damages were appropriate. 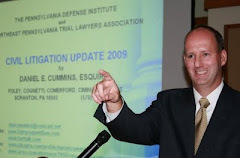 It is noted that Plaintiff’s case is being handled by Michael A. O’Donnell of the O’Donnell Law Offices in Kingston, Pennsylvania.